I've had so many comments recently asking about my current watch. Im not one of those girls who wears a chunky gold one or something OTT. Opting for sleek minmalistic designs over the chunkier more bold styles. My current watch of choice is this one from Casio. Minimal, bold with just the right of edge to set off my wrist candy. I feel like there is something about watches that add a certain "put togetherness" to an outfit! What do you think? This watch is indeed cool, thanks for showing it in detail! Your watch is beautiful! Sometimes something simple can make the ultimate statement! 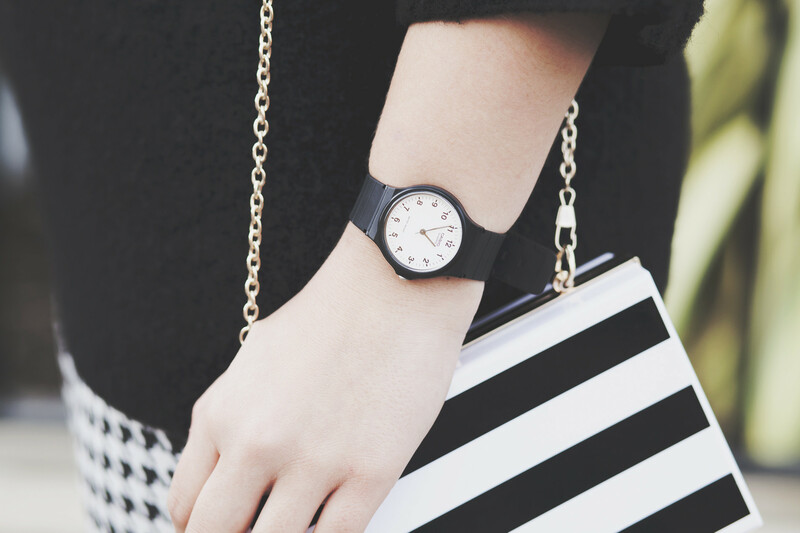 love the simplicity of this watch! I really like the casio kind of watches! Sensible, functional and it goes with the outfit. Good choice! Really love your watch. I have a quite a few watches as I love the silicon strap ones and have them in every colour. That watch is lovely! I also much prefer subtle, simple watches! Really love the watch and the price! Such a classic watch! I love it paired with the black and white stripes. Very chic! Gorgeous watch! Looks like it would suit a number of styles, perfect! They have such cool designs, I particularly love the retro square faced ones. Watches are very classy! My style is a little more edgy, so wearing watches kills it sometimes haha, but they look perfect with your style! That's a beautiful Casio watch! I'm currently on Swatch and DW but this is beautiful! Nooo way! I have one of the classic Cassio watches, but the smaller women's version. I don't like it that much anymore and have been looking for one with minimal hardware like this for ages! Had no idea Cassio did it haha.